It has been quite a season. 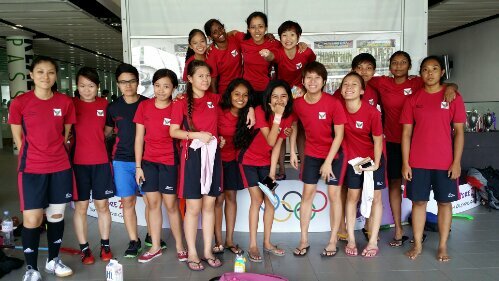 We did not win our semi-finals match but we learnt alot from our opponents and we wish them all the best in Div 1! 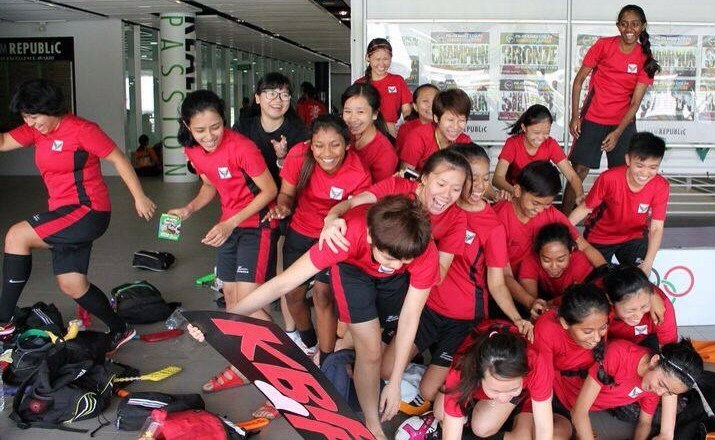 Congrats to NUS Jupitans & Hockey Campus! Our training will start next Tuesday. Do email me to let me know if you are coming. Details on our trial will be out soon. We are having a party for this week to celebrate our no fatty food & beer diet for 6 months! In more awesome news, our men’s team are Division 1 Champions! We are truly proud of our male fish team. From Div 3 to undefeated in Div 2 and now…the big league! Congrats!! Woah, we actually made it. The scoreline may look flattering but it was one hell of a fight. We scored then they scored then we did and they caught up. Tomorrow we face Hockey Campus in the semi-finals. Woah..semis for the first time! Hockey Campus is what we would powerrrr! in colloquial terms. But we will do our best of course. As our coach always says, we don’t have talent or skills so we can only rely on hard work. It has been a superb season that went beyond expectations. Alas, last season’s superb is next season’s expectations. We made it to the play-offs! What a bonus for the season. We are truly thrilled! Congralutations for your team making through to the knock-out stages of the Division 2 league, please kindly take note of the following fixtures for this weekend’s quarter and semi finals. Thank you. If the scoreline at the end of the regulation time remained level, the match will be decided by penalty shots (there will not be extra time played). We did it! We made it to the quarter-finals! We knew we had to secure these three points to qualify and thankfully we got the job done. Last year, we made it to the promotion table. This year, we are through to the q-finals. I am so pleased at the progress of this team. But, there is much more to learn, of course. 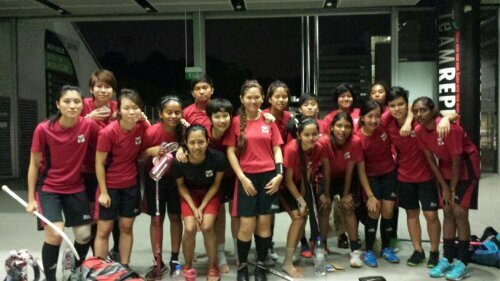 Our performance against NUS Callistans was even worse than our previous match again Hockey Campus. They had more purpose and drive than us. The worst part was that we somehow found ourselves leading by 3 or 4 goals. Goes to show it was a fluke. As a team, it is important to be sore losers. We need to get ourselves out of this rut. We know our season may end next week as we are not that good yet for the play offs. The team definitely needs reinforcement before the next season. The bright side is that our position in the league table is constantly rising. Trials for next season will commence soon! Hockey Campus handed us our first defeat in the league with their 33 shots on target. Their players are really fit and skilled. It was a tough game though we did expect it. Alot of positives but we must learn and buck up for our next difficult game against NUS. 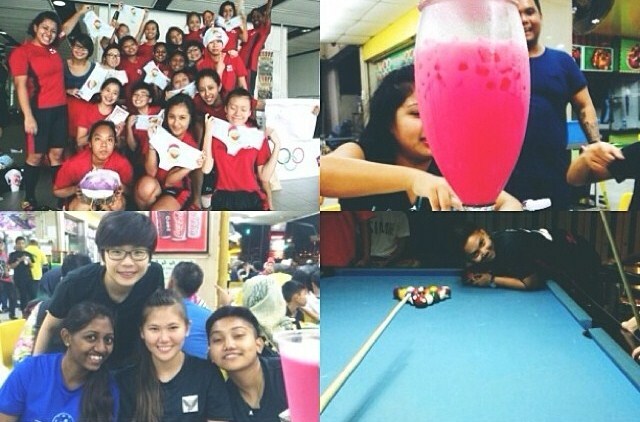 It was a fun-filled night with our special Bandung tower and pool with the Tazsilian Piranhaz guys. Joe and Shavon are such good pool players! while the rest of us should honestly stick to floorball. Especially Francine HAHA!